I'm a systems architect, currently employed as Sr. Director of Architecture at Nexenta Systems. My recent work has been on object storage clusters. My background includes a lot of networking, including RDMA, and consumer electronics (Cable TV and digital video). If you are not familiar with ZFS, you should be. It is the best local file system ever developed. It’s also likely to retain that title forever, because improving the local file system is not where the storage industry’s head is at these days. Distributed storage is the only way to scale-out to the degree that storage now requires. My first design for Object Storage at Nexenta sought to leverage ZFS as one implementation of a “Local File System” superclass. It could bring benefits to both our Object Storage clusgter and to OpenStack Swift. This was a natural progression with evolutionary design. Nexenta is a ZFS company and we were very familiar with ZFS. We wanted to take advantage of the protection provided by ZFS within one server with distributed data protection. We dubbed this the “2+2” strategy. I presented the idea at the OpenStack Folsom summit. The obstacles to this approach proved to be too high. 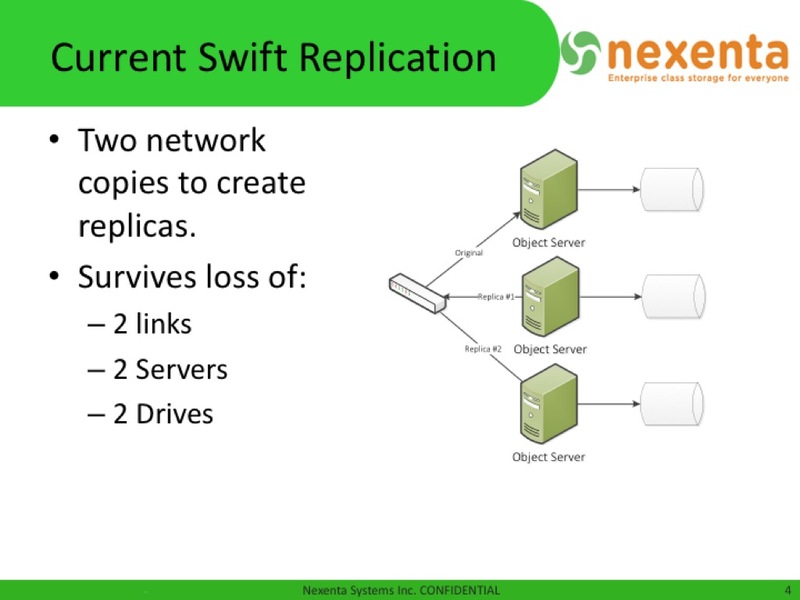 Relying on two network replicas where each machine keeps a high reliability mirror (“2 by 2”) can only achieve the same availability if you have two network ports on each storage server. Without dual network ports the loss of a single network interface leaves you only a single failure from losing access to data. But dual ports are a concept that virtualization management simply does not want to understand. It wants a single Ethernet link to a single storage node. They either work as a complete unit, or they do not. 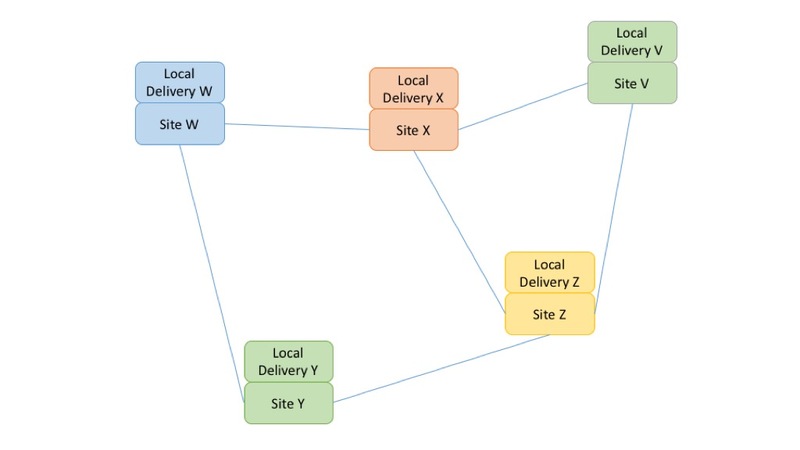 A “2×2” solution requires tracking nodes that are in “limping” states such as knowing when a storage node is only reachable by one of its two links. Keeping track of the state of each server as being either “working”, “limping” or “dead” sound simple enough, but just “working” or “dead” is a lot simpler. There are other conditions that can put a storage device in a “limping” state where it can be read but should not be written to, such as a drive that is starting to fail. But this is the only thing that would require the management plane to add this concept. Management plane developers hate adding more concepts when 90% of the world is happy without the additional work. So that wasn’t going anywhere. We also realized that multicast UDP was a much better solution. Rather than battling to get network management improved so that we could go from 2 excess deliveries to 1 excess delivery we could just use multicast UDP and end up with 0 excess deliveries. All of these issues were actually minor compared to the challenges of providing high performance object storage using Python. Basically, it does not work. Swift advocates will claim otherwise, but they are trying to con you that Object Storage should not be expected to be as high performance as SAN or NAS storage. I don’t buy that line of thinking. There were several new ideas that we wanted to incorporate in the design, all of which will be covered in later blogs. Totally decentralized control and namespaces. Using multicast communications rather than point-to-point protocols such as TCP/IP. Avoiding the constraints of Consistent Hashing. Truly embracing Key/Value storage, top-to-bottom. ZFS never overwrites in-use data. It writes new data, and then references the new data. The new object storage system would end up taking this even farther. Each new chunk has its content written exactly once. It can be replicated as needed, but a chunk once written is never updated. It is not enough to respond to errors when disks report them. You need to validate the data read versus checksums stored elsewhere. The new object storage system uses cryptographic hashes of each chunk’s payload to identify, locate and validate each chunk. The easiest way to always be consistent on what is written to persistent storage is to never write any data which a later action can invalidate. The CCOW (Cloud Copy-on-Write) object storage system does not rely on any information stored about any chunk other than its cryptographic hash identifier. ZFS relies upon transaction logs to maintain its “always consistent on disk” goal. The data on disk is consistent, after you apply the pending transactions in the log after a sudden reboot. Updating the root after every transaction is the only other way to always be consistent on disk, and that would require far too many disk writes. NexentaEdge uses the same technique to allow eventual update of related data structures after a new Version Manifest is written. It cuts the number of disk writes required before an acknowledgement of a Version Manifest Put transaction nearly in half. ZFS creates snapshots by not deleting them. It can turn them into clones by simply allowing new version forks to branch from there. Keeping this with a distributed object system was a challenge, but we came up with a method of truly snapshotting a distributed set of metadata. To push the photo analogy it is a true snapshot that captures the system state at one instant, it just needs to be developed before you can see the picture. I’ll describe that in a later blog. How a system replicates data after it is put is not an afterthought. ZFS features snapshot driven replication. That feature is retained by NexentaEdge, just using NexentaEdge snapshots instead. Perhaps the most important lesson is an inherited attitude. ZFS was accused of being a “Rampant Layering Violation”. Jeff Bonwick’s response (https://blogs.oracle.com/bonwick/entry/rampant_layering_violation) was that it was merely more intelligent layering that picked more effective divisions of responsibilities. NexentaEdge will likely be accused of far worse layering violations. The Replicast protocol considers storage distribution and network utilization at the same time. Since the end user ultimately pays for both we see nothing wrong with optimizing both of them. This is still layered – we only optimize traffic on the storage network. It is physically or logically (VLAN) separated from other networking. Optimizing the storage network for storage is just common sense. NexentaEdge storage servers use key value storage, whether physical or a software simulation of key/value storage. This is the simplest API for copy-on-write storage to use. While it might have been possible to define a key/value ZVol it just isn’t worth the effort. There is too little left of single machine ZFS left to make it worth building NexentaEdge on top of ZFS. The ideas of ZFS, however, inspired the entire design effort. BIER vs Transactional Subset Multicasting – An interesting case of differing perspectives. As noted in my previous blog on Transactional Subset Multicasting a distributed object cluster greatly benefits from push-mode multicasting. The sender determines the set of recipients rather than the recipients joining a group. Having the listeners join the multicast group adds a round-trip delay to every join. For a distributed storage cluster a dynamic group would have to be formed for each chunk put. That would typically be every 128 KB to 2 MB. That would be expensive even if IGMP/MLD joins executed promptly. They do not. The only thing that is slower than IGMP/MLD joins are IGMP/MLD leaves. There is only minimal harm in not instantly shutting off an end stations reception of a stream it has lost interest in. But when you are trying to manage exactly which packets are delivered via which edge links you need the Leaves to process just as quickly as the Joins. So naturally I was very interested in BIER. The NexentaEdge application more needs a short list of destinations, but a bitmap can be fairly efficient. BIER can even narrow the mapping to a “sub-domain” or a subset of a sub-domain’s bitmap using a “Subset Identifier” (SI). The bottom line is that each Negotiating Group could be mapped to a 64-bit bitmap. A single 64-bit map is shorter than a list of IPV6 addresses, so header space would not have been a problem. While BIER looked like an interesting alternate solution to push multicasting I kept getting confused reading the BIER drafts. They seemed amazingly tolerant of inefficient forwarding algorithms. More importantly there was no effort to map BIER forwarding to the currently deployed L2 forwarding tables used by typical current generation switches. I was particularly intrigued by the BIER-TE (BIER-Traffic Engineering) draft. It seeks to optimize the end-to-end packet flows by adding extra bits for use by intermediate routers. Basically, ingress routers would determine what paths that intermediate routers should use for this packet and set extra bit positions accordingly. The intermediate routers do not need to understand topology, just which bit position represent its links. The draft also cleverly identifies several cases where the same bit position can be safely used for multiple non-conflicting purposes. This avoids exploding the bitmap size needed. The assumption here is that the intermediate forwarders could not possibly be expected to know the forwarding path for each bit. Each Edge switch/router only has to know the forwarding required for the applications that are relevant to the nodes on that edge switch. A core switch/router would have to know the forwarding for every application. This line of thinking is nearly the opposite of the thinking for distributed storage clusters. The Replicast transport protocol assumes a non-blocking, no-drop core. It then worries about how to load-balance the deliveries to edge links and how to fully utilize those links without ever over-subscribing them. The goal is balancing traffic at the edge of the cluster. The core takes care of itself. 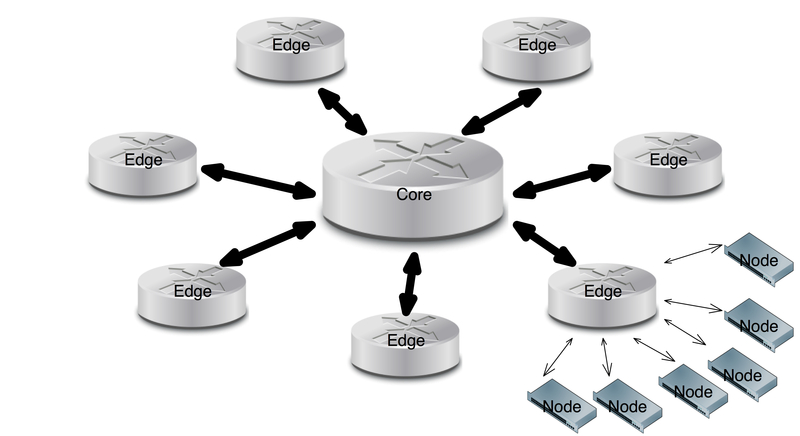 In the following illustration some of the edge nodes are shown connected to the Edge switch on the bottom right. There would actually be more Edge nodes, and they would be attached to every Every switch. With this type of network, Replicast does not need to optimize switch-to=-switch traffic at all. If a packet has non-local destinations it could be flooded out of every port to reach all other switches. As long as those switches did not loop the packet, or deliver it to any non-addressed edge port, everything will be fine. A non-blocking core has the capacity to deliver the frame to every edge switch, so delivering packets to a subset when the targeted set of ports does not happen to include every edge switch is nice but not necessary to make the network work. But in a Replicast network it is exactly the last five yards that are in danger of being flooded. 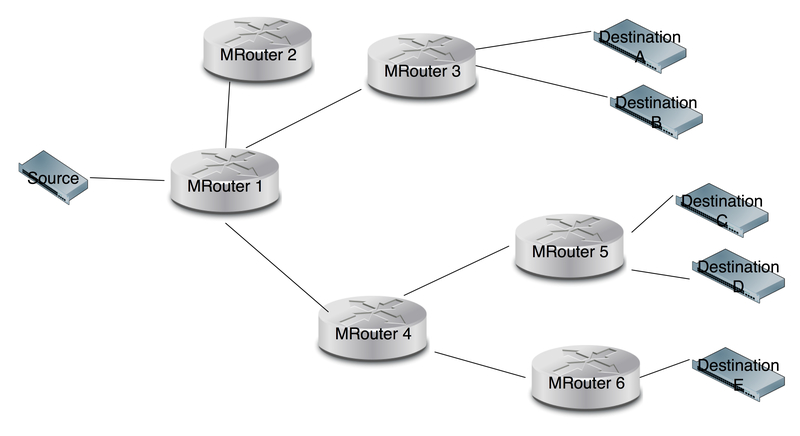 MRouter 4 –> MRouter 5 –> Destination E.
Specifically, the packet is only relayed from MRouter 1 to MRouter 4 once (and from MRouter 1 to MRouter 3 once). It is not relayed form MRouter 1 to MRouter 2. When this is your concern, having the target MRouter flood the packet locally is undesirable (or unicast delivery it N times), but certainly not the end of the world. Tuhe hard work was getting it to the very small subset of edge MRouters that had subscribers. Totally divergent goals, but the same protocol seems applicable to both problems. This is what you want to see in a good protocol. How are Users Supposed to Set These Extra Bits? Who are Users? I was still troubled by some gaps that looked just glaring to me in the BIER-Traffic Engineering proposal. Exactly what would an application be expected to understand when it filled out this bitmap? Where was its source of information for this extended bitmap? Who was responsible for setting which bits? How were they supposed to map a desired destination IP address to one or more bit positions? How long would a mapping remain valid? > How does an application use this? >    imposed on the host or BFIR on a per packet basis? I was trying to optimize traffic on the edge links. Everyone else was optimizing the router-to-router links. I was primarily thinking of L2 subnets, routers could exist but they were the exception. Everyone else was think of the routers and only incidentally of L2 delivery. I was thinking that one bit represented an end station. Everyone else was thinking that it was an edge router. Amazingly the entire infrastructure fits either mode of thinking. If you view each end station as being its own BIER then everything in the architecture document is fully applicable to end-station delivery. The only exception is that the forwarding pseudo-code does not explicitly include a step for using a single L2 multicast delivery to reach N local destinations. But that is certainly consistent with the intent, as that it explicitly states that when forwarding router to router that you should only send a single BIER packet down any one port. Unicast deliver the current packet to each of the ports. Configure the transactional multicast address to reach that set of local ports. The reference multicast address is the entire BIER sub-domain or s specific SI-selected slice of it. Use the transactional subset multicast address for subsequent packets until the forwarding rule is aged out or superseded by a newer set that needs the multicast address. As mentioned in prior blogs, NexentaEdge is an Object Cluster that uses multicast for internal communications. Specifically, we use multicast IPv6 UDP datagrams to create, replicate and retrieve Objects. Creating replicas of object payload on multiple servers is an inherent part of any storage cluster, which makes multicast addressing very inviting. The trick is in doing reliable transfers over unreliable protocols.But there are numerous projects that have already proven this possible. I was familiar with reliable MPI rendezvous transfers being done over unreliable InfiniBand. There was no need to set up a Reliable Connection, once the rendezvous is negotiated the probability of a dropped datagram is nearly zero. The TCP checksum is useless for validating storage transfers anyway. A comparison of a hash checksum of the received data is needed to protect data – sixteen bits of error detection isn’t enough for petabytes of storage. If the ultimate accept/reject test has nothing to do with the transport protocol then the only question is whether the probability of losing any single datagram is sufficiently low that you don’t care if on extremely rare occasions you have to retransmit the entire chunk as opposed to specific TCP segments. When the probability of a single drop is low enough it is actually better to send fewer acks. But an ack-minimizing strategy depends on there being very few drops. Modern ethernet has extraordinarily few transmission errors. Drops are almost exclusively caused by network congestion. With sufficient congestion control “unreliable” transport protocols become effectively reliable. This can be built from low level “no-drop” Ethernet combined with a higher layer application protocol. 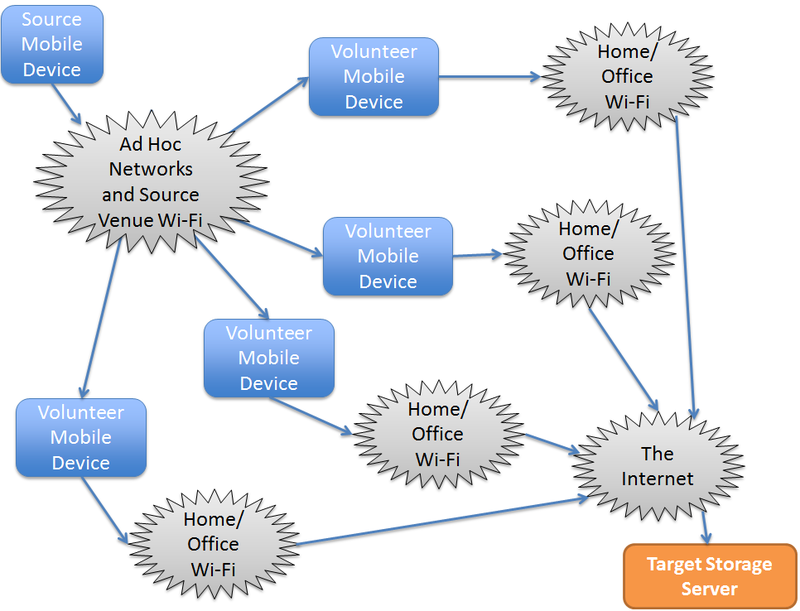 The focus of this blog, however, is on formation of multicast groups. As first drafted our Replicast transport protocol uses pre-existing “Negotiating Groups” of 6 to 20 nodes to select the targets (typically 3 or less) of a specific transactional multicast. We called the dynamically created group a “Rendezvous Group”. However, the existing multicast group control protocols (IGMP and MLD) are not suitable for our storage application. The latency on joining a group can be longer than the time it takes to write the chunk. The only type of cluster I have been involved in developing is a storage cluster, but I have worked with supporting high performance computing clusters (especially MPI) while working at the pure network level. My sense of those applications is that a source knowing the set of targets that should get a specific message is common. It is very hard to imagine that this need is unique to our specific storage application. There must be many cluster applications that would benefit from multicast transmission of transactional messages. For example, I can recall a lot of MPI applications that were using RDMA Reads to fetch data, and those were not point-to-point fetches. I suspect that a reliable multicast push would have matched the application needs more closed than RDMA Reads. The problem is that IGMP/MLD joins simply do not meet the needs for transactional data distribution. Not only was the latency terrible, but the transaction is wrong. In our application it is the sender who knows the set of targets to be addressed. With IGMP/MLD we have to first multicast to the Negotiating Group what set of targets we need to join the Rendezvous Group. So we’re adding a cluster trip time snd worst case kernel latency to the already bad latency in most IGMP/MLD implementations. What we needed was the ability to quickly set the membership of a Rendezvous Group for the purposes of setting up a single rendezvous delivery. We only care about the sender identified receivers who receive the entire set of datagrams in the transaction. However, this all depends on being able to quickly configure multicast groups. The solution we came up is mind-numbingly simple. It was apparently too mind-numbingly simple because we kept getting blank stares from numbed minds. The experts who had worked on the existing solutions kept mumbling things about their solution while only vaguely conceding that those solutions do not work for our application. At the core of the problem is that they were focusinsetg on long-haul L3 multicasting. What we wanted was local L2 multicasting. Set the forwarding portset for Multicast Group X in VLAN Z to be a subset of the forwarding portset for Multicast Group Y in VLAN Z. The specific subset must is the union of the forwarding Portset for a set of unicast addresses in VLAN Z: Addr1, Addr2, … The unicast addresses may be specified as L2 MAC addresses or L3 IP addresses, but they must be within the same VLAN. The key is that this algorithm is executed on each switch. Consider a three switch cluster, with an existing Negotiating Group X which has members X1 through X9. We want to configure a Rendezvous Group Y that will multicast to X1, X4 and X8. The last row (Multicast to X1, X4 and X8) can be formed from data each switch already has, each applying the same instruction to that data. That’s it. Just execute that instruction on each switch and the subset multicast group will be created. It doesn’t even have to be acknowledge, after all the UDP datagrams are not being individually acknowledged either. The switch set up and the follow-on rendezvous transfer will be confirmed by the cryptographic hash of the delivered payload. It either matches or it does not. I have submitted an IETF draft: https://tools.ietf.org/html/draft-bestler-transactional-multicast-00, but there hasn’t been much reaction. This is a very minimal enhancement to IGMP/MLD snooping. There is no change to the underlying L2 forwarding tables required. The same forwarding entries are being created, just with simpler transactions. This is an important constraint. If we could modify the firmware that actually forwards each packet we could just specify a “Threecast” IP header that listed 3 destination IP addresses. But there is no way that will ever happen, we need to deal with switch chips as they are. There is no additional state that the switches must maintain, in fact there is less tracking required for a transactional subset multicast group than for a conventional multicast group. The lack of response presents a challenge. The people who understood multicast did not understand storage, and most of the people who understood storage did not understand multicast. We could do switch model specific code to shove the correct L2 forwarding rules to any given switch model, but that was not much of a long term solution. The required IGMP/MLD snooping required for this technique can be implmented in OpenFlow, but the number of switches that allow OpenFlow to modify any flow is extermely limited, effectively reducing it to being a “switch specific” solution. OpenFlow does have the benefit of being constrained. Other local interfaces are not only model specific, they are unconstrained. In order to be able to do anything you effectively have to be given permission to do everything. In order for the network administrator to enable us to set those tables they would have to trust our application with the keys to their kingdom. As a general rule I hate asking the customer network administrator to do something that I would fire my network administrator for agreeing to. The Push model solves that because it only sets up multicast groups that are subsets of conventionally configured (and validated) groups, and only for the duration of a short transaction. We came up with an alternate solution that involves enumerating the possible Rendezvous Groups sufficiently before they are needed that the latency of IGMP/MLD joins is not an issue. The transaction processing then claims that group in real-time rather than configuring it. I’ll describe that more in the next blog. For the balance of this blog I’d like to re-iterate exactly why push multicasting makes sense, and is very simple to implement. It is also totally consistent with existing IGMP/MLD. It is really just a specialized extension of IGMP/MLD snooping. How is the group identified? What are the endpoints that receive the messages? What is the duration of the group? Who are the potential members of the group? How much latency does the application tolerate? Question 1: How is the Group Identified? In IGMP/MLD listeners identify themselves. It is pull-based control of membership. The sender does not control or even know the recipients. This matches the multicast streaming use-case very well. However it does not match a cluster that needs to distribute a transactional message to a subset of a known cluster. One example of the need to distribute a transactional message to a subset of a known cluster is replication within an object cluster. A set of targets has been selected through an higher layer protocol. IGMP-style setup here adds excessive latency to the process. The targets must be informed of their selection, they must execute IGMP joins and confirm their joining to the source before the multicast delivery can begin. Only replication of large storage assets can tolerate this setup penalty. 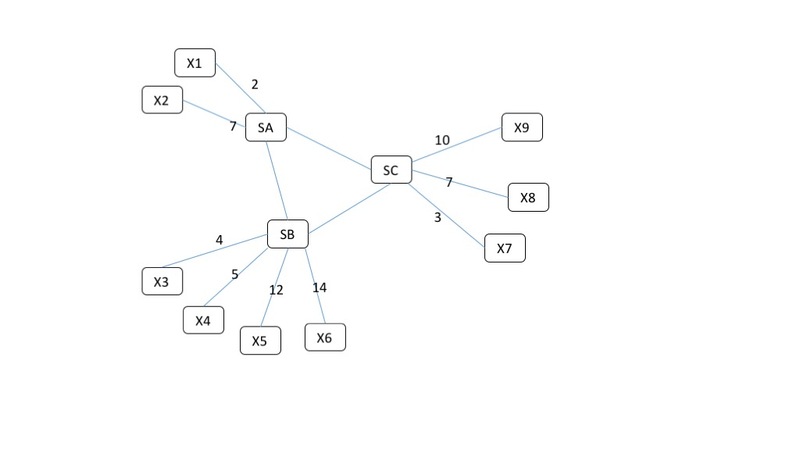 A distributed computation may similarly have data that is relevant to a specific set of recipients within the cluster. Having to replicate the transfer over multiple unicast connections is undesirable, as is having to incur the latency of IGMP setup. Two solutions will be proposed where a sender can form or select a multicast group to match a set of targets, without requiring any extra interaction with THOSE targets as long as the targets are already members of a pre-existing multicast group. Allowing a sender to multicast to any set of IP addresses would clearly be unacceptable for both security and network administration reasons. Question 2: What are the endpoints that receive the messages? For the specific storage protocol we were working on the desired endpoints are virtual drives, not IP endpoints. A given storage server can determine which of its virtual drives is being addressed solely from the destination multicast IP address. One of the questions we are seeking feedback on is whether this is unique to this storage protocol, or whether the ability to identify a multicast group as a set of higher layer objects is generally desirable. Question 3: What is the duration of the group? IGMP/MLD is designed primarily for the multicast streaming use-case. A group has an indefinite lifespan, and members come and go at any time during this lifespan, which might be measured in minutes, hours or days. Transactional multicasting seeks to identify a multicast group for the duration of sending a set of multicast datagrams related to a specific transaction. Recipients either receive the entire set of datagrams or they do not. Multicast streaming typically is transmitting error tolerant content, such as MPEG encoded material. Transaction multicasting will typically transmit data with some form of validating signature that allows each recipient to confirm full reception of the transaction. This obviously needs to be combined with applicable congestion control strategies being deployed by the upper layer protocols. The Nexenta Replicast protocol only does bulk transfers against reserved bandwidth, but there are probably as many solutions for this problem as there are applications. The important distinction here is that there is no need to dynamically adjust multicast forwarding tables during the lifespan of a transaction, while IGMP and MLD are designed to allow the addition and deletion of members while a multicast group is in use. The limited duration of a transactional multicast group implies that there is no need for the multicast forwarding element to rebuild its forwarding tables after it restarts. Any transaction in progress will have failed, and been retried by the higher-layer protocol. Merely limiting the rate at which it fails and restarts is all that is required of each forwarding element. Question 4: Who are the members of the group? IGMP/MLD is designed to allow any number of recipients to join or leave a group at will. Transactional multicast requires that the group be identified as a small subset of a pre-existing multicast group. Building forwarding rules that are a subset of forwarding rules for an existing multicast group can done substantially faster than creating forwarding rules to arbitrary and potentially previously unknown destinations. Question 5: How much latency does the application tolerate? While no application likes latency, multicast streaming is very tolerant of setup latency. If the end application is viewing or listening to media, how many msecs are required to subscribe to the group will not have a noticeable impact to the end user. For transactions in a cluster, however, every msec is delaying forward progress. The time it takes to do an IGMP join is simply an intolerable addition to the latency of storing an object. This is especially so in an object cluster using SSD or other fast storage technology. The IGMP/MLD Join might take longer than the actual writing of storage. Multicast Groups configured by this method are constrained to be a subset of a conventionally configured multicast group. No datagram can reach any destination that it cannot already reach by sending the datagram to referenced group. Obviously the application layer has to know the meaning of packets sent on each multicast group, but that is already true of existing multicast UDP. Set the multicast forwarding rules for pre-existing multicast forwarding address X to be the subset of the forwarding rules for existing group Y required to reach a specified member list. This is done by communicating the same instruction (above) to each multicast forwarding network element. This can be done by unicast addressing with each of them, or by multicasting the instructions. Each multicast forwarder will set its multicast forwarding port set to be the union of the unicast forwarding it has for the listed members, but result must be a subset of the forwarding ports for the parent group. For example, consider an instruction is to create a transaction multicast group I which is a subset of multicast group J to reach addresses A,B and C. Addresses A and B are attached to multicast forwarder X, while C is attached to multicast forwarder Y. On forwarder X the forwarding rule for new group I contains: The forwarding port for A. The forwarding port for B. The forwarding port to forwarder Y (a hub link). This eventually leads to C. While on forwarder Y the forwarding rule for the new group I will contain: The forwarding port for forwarder X (a hub link). This eventually leads to A and B. The forwarding port for C.
Many ethernet switches already support command line and/or SNMP methods of setting these multicast forwarding rules, but it is challenging for an application to reliably apply the same changes using multiple vendor specific methods. Having a standardized method of pushing the membership of a multicast group from the sender would be desirable. But having a product depend upon a feature you are trying to get adopted doesn’t work so well. We needed a method of dynamically selecting Rendezvous Groups that was compatible with terrible IGMP/MLD Join latencies. I’ll explain that in the next blog. A distributed storage system has do a great job of replicating content. Building a highly available storage service out of mildly reliable storage devices requires replicating after each failure. Replication is not an exception, it is a continuous process. So it’s important. The design of the CCOW (Cloud Copy-on-Write) object storage system deals with replication within a local network very well. What it does not deal with anywhere near as well is spreading content over very long round-trip-times, as in different sites. I needed a feature that would allow customers to federate multiple sites without requiring 40 Gbe links connecting the sites. This is not specific to CCOW object storage. The need to provide efficient storage locally will force any design to partition between “local” updating, which is fairly fast, and “remote” updating which will be considerably slower. If you don’t recognize this difference you’ll end up with a design that does all updates slowly. But I needed a solution for CCOW. My first thought on how to replicate content between federated sites was to just layer on top of software bridges. Each site can be thought of as a switch. The “switch” can deliver frames (chunks) to local destinations, or to links to other switches (sites). A frame (chunk) is never echoed to the same link that it arrived upon. There is no need to provision a site topology, the Spanning Tree will discover it. The latter spanning tree algorithms will do it better. If you are not familiar with the Spanning Tree algorithms I suggest you go read up on them. Spanning Tree made Ethernet networking possible. See https://en.wikipedia.org/wiki/Spanning_Tree_Protocol. Spanning Tree algorithms effectively prevent loops by logically de-activating some of the links. So re-using existing software (software switches and existing long-haul tunnels) was a very tempting solution, especially since it directly re-used networking layer code to solve storage layer problems. Pontificating that networking solutions are applicable to storage is one thing, actually leveraging network layer code would prove it. This leads to the following distribution pattern, in this example for a frame originating from Site V.
But it turns out that the storage layer problem is fundamentally simpler. Radia Perlman’s spanning tree prevnts loops by discovering the links between the switches, and without central decision making de-activates a subset of the links so that would have enabled forwarding loops. It does this no matter how the switches are linked. It de-activates links to avoid loops. This is needed because Ethernet frames do not have a time-to-live marker. Without spanning tree it would be very easy for Switch A to forward a frame to Switch B, which would forward it to Switch C which would forward it to Switch A. While rare, such loops would crash any Ethernet network. Spanning tree was a simple algorithm that prevented that totally. The fundamental assumption behind spanning tree was that links had to be de-activated because switches could not possibly remember what frames they had previously forwarded. Recognizing that a frame was being looped around would require remembering frames that have been forwarded eons previously, possibly even milliseconds. If you understand how switches work the last thing any switch wants to do is to remember anything. Remembering things takes RAM, but more critically it takes time to update that RAM. RAM may get cheaper, but remembering things always takes longer than not remembering them and switches will kill to trim a microsecond from their relay time. But remembering things is exactly what a storage cluster is deigned to do. Replicate Chunk X on all other inter-site inks. That’s it. Having a cryptographic hash fingerprint of each chunk makes it easy to identify already seen chunks. This allows multiple sites to forward chunks over ad hoc links without having to build a site wide map, and all links can be utilized at all times.